Description: Student leaders & registered team member meeting. Description: CTK Students gone on D.C. bus trip as College Mentors for high schoolers. Please pray for a growth in respect to all life in our communities. Description: Guest Speaker from Dynamic Catholic - "What a Beggar Taught Me About Being Catholic"
Description: CTK Students gone to WYD 2019. Please pray for them! Description: Meet in green space in front of BR Capitol by LSU flag at 9:30am to march to North Blvd Plaza. Description: For all new Lectors. Description: For all new Eucharistic Ministers of Holy Communion. Student leaders & registered team member meeting. CTK Students gone on D.C. bus trip as College Mentors for high schoolers. Please pray for a growth in respect to all life in our communities. 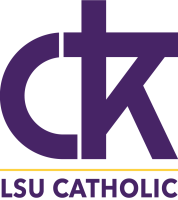 Guest Speaker from Dynamic Catholic - "What a Beggar Taught Me About Being Catholic"
CTK Students gone to WYD 2019. Please pray for them! Meet in green space in front of BR Capitol by LSU flag at 9:30am to march to North Blvd Plaza. For all new Eucharistic Ministers of Holy Communion.